With three offices in Cypress and Houston, Dey Optical has been serving the Northwest area for more than 20 years. Our offices are conveniently located at 13333 Dotson Rd in Houston and 21216 N.W. Frwy, and 9645 Barker Cypress, both in Cypress. 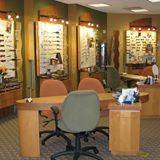 You are welcome to drop in anytime to browse through our large selection of designer eyeglass frames and sunglasses. Welcome to DEY Optical, serving Willowbrook in the Northwest area.